Some stretches of B.C.’s foggiest, rainiest, snowiest highways now have extra “glow,” due to the latest in pavement marking technology used by the ministry. The plastic liquid is applied in a spatter pattern that comes out looking like clumpy oatmeal. Because the textured mixture doesn’t sit smoothly, it has more angles to reflect light, and disperses water quickly. The special markings also have extra dazzle, from glass beads incorporated into the mix, and more beads dropped onto the surface. The result is highway markings that reflect light from headlights and shine brightly in dark, foggy and wet conditions, keeping motorists well aware of where they need to be. 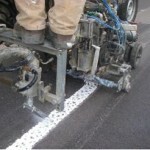 As well, the markings are skid-resistant, environmentally friendly and extremely durable. 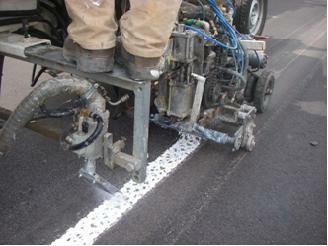 The materials and equipment used to apply these super-reflective road markings cost more than those used for our regular line painting jobs, and the procedure is more involved. So, it’s only applied to select stretches of road where visibility can be especially poor, whether due to geography or weather. Given the expense, we want to make sure the new markings last as long as possible. The solution: grind a channel into the pavement, and inlay the markings there, to protect them from snowplow blades. 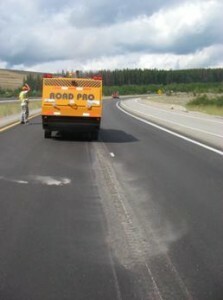 Other places which feature these high-tech markings are a 2.7-kilometre, four-lane stretch of Highway 16, east of Prince George; 4.2 km on Highway 16, west of Prince George; from Drought Hill to Brenda Mine, on Highway 97C; and from Comstock to Salem Creek, on the Coquihalla. When it comes to places on B.C.’s highways, where visibility is extra crucial and weather conditions can be downright nasty, we know the “oatmeal spatter” can really matter, to keeping motorists safe. Why isn’t this used on the accident prone, winding, 2 lane, snowy sections of the Trans-Canada? Thanks for your question. We asked our material specialists and they confirmed that while this product has not been applied on the Trans-Canada Highway in the Revelstoke/Golden area, it was applied on a 5.3-kilometre stretch along Highway 16, 32 kilometres east of Prince Rupert, which is prone to particularly challenging weather, a 2.7-kilometre, four-lane stretch of Highway 16, east of Prince George; 4.2 km on Highway 16, west of Prince George; from Drought Hill to Brenda Mine, on Highway 97C; from Comstock to Salem Creek, on the Coquihalla; Highway 1 in the Kamloops area between Columbia St and Copperhead Interchange as well as H97 in Quesnel from Quesnel Hydraulic to the Jctn. H26. 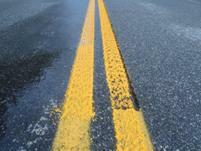 It has also been applied in several areas in the lower mainland where traffic volumes and rainy nights are an issue.